SKYVVA Adapter is a connector/device which store the property configuration of external system. Adapter is important, without it you can’t transfer the data. It provides the interface between a computer and a network connection. There are many different types of adapters such as File Adapter, FTP Adapter and JDBC (Database) Adapter, SAP-PI/PO Adapter and SAP-ERP Adapter. This document will describe about adapter which is being used in Agent. File adapter is used to integrate data from file to SFDC and from Salesforce to file. The file type that our Agent support is CSV, XML and Excel that can be integrated with their content. You can integrate file attachment into attachment object. This document is focus only on the creation of adapter, so some steps before it would be skip eg. Creating Integration and Interface. Run Agent UI > Integration Wizard > Choose Integration > Choose existing interface. – File Name: Choose file name (a file name for agent to query data from. If this field is empty it mean you to select all files in the selected folder. · Keep File: The file will keep in the folder. · Lock File: The file will lock. · Delete File: The file will delete. · Backup File: The file will backup in the other folder. – Backup Folder: The folder to keep the processed file. If you choose to backup your file, you have to input your folder name here. Click “Test Source Connection” to test the connection to the specified folder and file. Note: For Excel and XML File, you can just do the same as CSV File. But just you need to change the file types, adapter and its properties accordingly. JDBC Adapter is used as a connector to transfer data from Database to Salesforce and from Salesforce to Database. Agent supports five database type include Oracle, SQLServer, MySQL, MsAcess and PostgreSQL. The following sample is about SQLServer configuration. 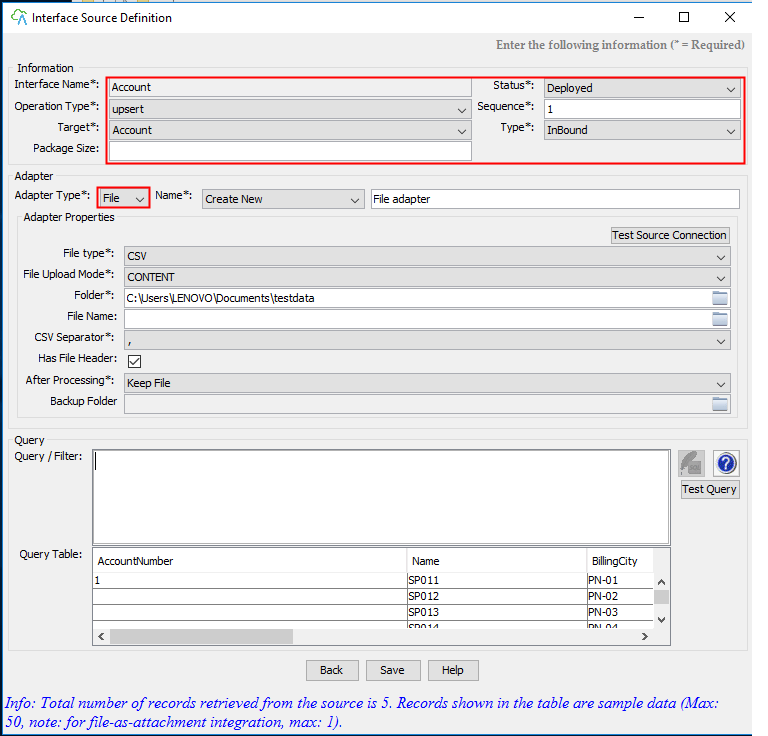 Adapter Properties:- Database type: Choose SQLServer. The type of database to which the adapter connects. Select between SQLServer or other. – Username: sa- Password: ******* (The default password to use when making the connection to the database). Note: For Oracle, MySQL, MsAcess and PostgreSQL database, you can just do the same as SQLServer. But just you need to change the database types, adapter and its properties accordingly. 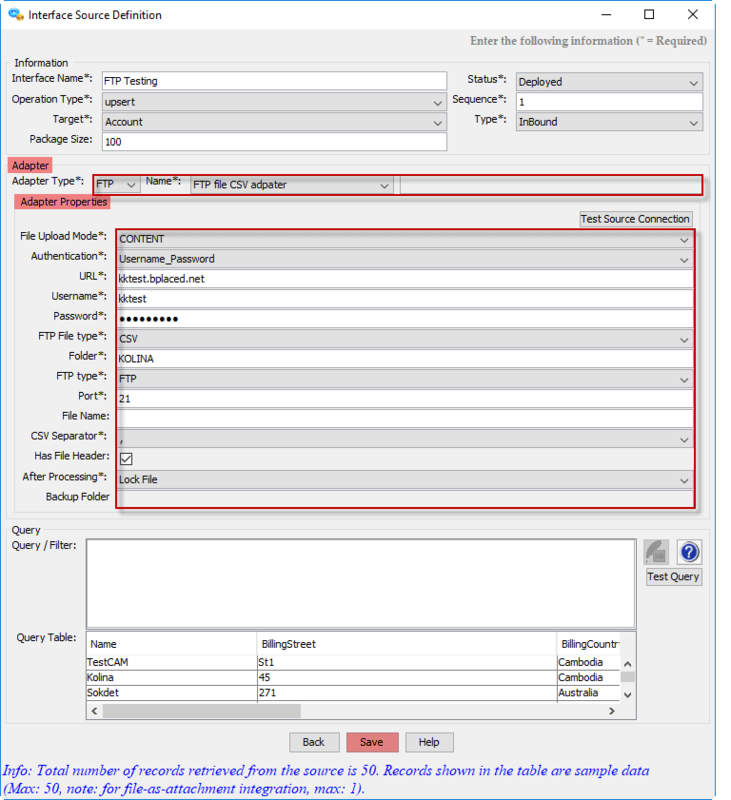 FTP Adapter is used as a connector to transfer data from FTP server to Salesforce and from Salesforce to FTP server. • Keep File: The file will keep in the folder. • Lock File: The file will lock. • Delete File: The file will delete. • Backup File: The file will backup in the other folder. Note: For SFTP configuration, please kindly look for document (SFTP Configuration).